Нашите уебсайтове използват решенията, предоставени от Хотяр оод (Hotjar Ltd)-инструмент за анализ на поведението на потребителите, като:heatmaps, записване на движенията на потребителя на уебсайта, пътеките на конверсия (clickmaps, movemaps, scrollmaps). Последяващият код Хотяр може да събира следната информация: IP адрес на устройството (кодирано по такъв начин, който прави невъзможно идентифицирането на потребителя), имейл адрес, трите имена на потребителя (без разрешение за по-нататъшна комуникация), тип устройство и неговите параметри и вид браузър, държавата от която идва връзката. Получените данни се обработва колективно и по анонимизиран начин. Повече информация за услугите за защита на данните на Хотяр оод можете да намерите тука: https://www.hotjar.com/privacy. The new global trend in energy saving and environmental awareness is focused on energy efficiency. One of the methods of ensuring energy efficiency are mechanical ventilation and air conditioning systems with energy recovery. The use of energy recovery, in addition to the clear ecological effects, also provides measurable benefits to the user in the form of reduced operating costs of ventilation or air conditioning systems. 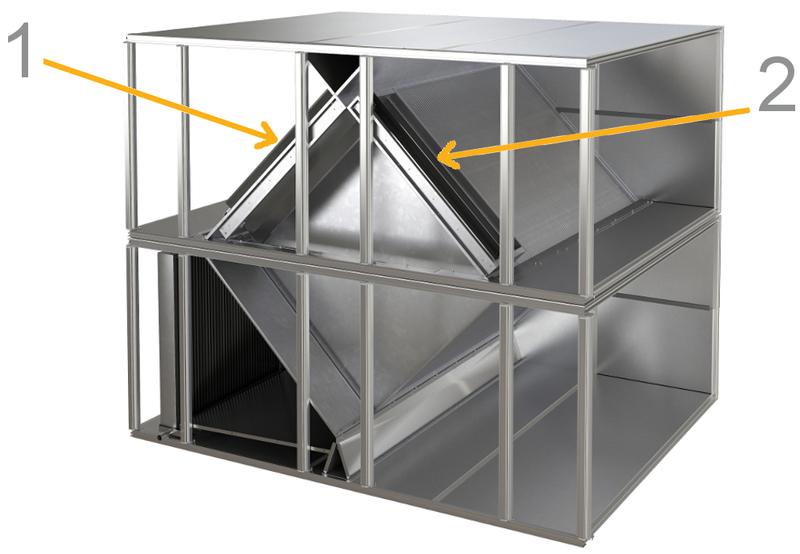 Greater recovery efficiency usually requires greater project implementation costs and, sometimes, greater amount of space needed to install the ducts and air treatment equipment. Due to the high implementation cost required to ensure low operating costs, installation companies and manufacturers are tempted to offer the project owner high efficiency at low price. In specifications of energy recovery efficiency, the efficiency is given as a percentage. This is where the manufacturers of recovery systems or project owner’s engineers present varied approach to defining the recovery efficiency. Efficiency may be calculated as total, sensible, dry or latent. Each of those values may be defined in reference to supply air or exhaust air. 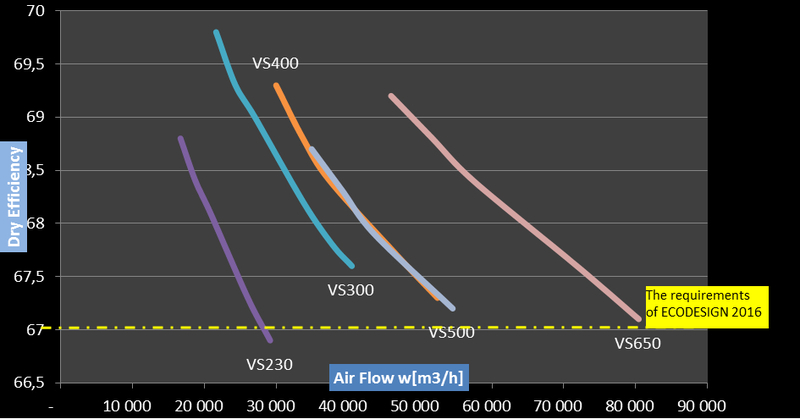 The efficiency of a system is strongly dependent on the air parameters upstream and downstream of the exchanges, on the relation between the volume of supply air and exhaust air and on the flow rate of the air flowing through the exchanger. As demonstrated above, there is a fairly large number of parameters that can be used to manipulate the percentage value of energy efficiency. Therefore, the European Commission, in its regulation: “COMMISSION REGULATION (EU) No. 1253/2014 of 7 July 2014 implementing Directive 2009/125/EC of the European Parliament and of the Council with regard to ecodesign (ErP 2016 – Ecodesign 2016) requirements for ventilation units,” specifies the formula and requirements for the calculation of energy recovery efficiency. That formula is in line with European industry standards No. EN 13053 and No. EN 308. 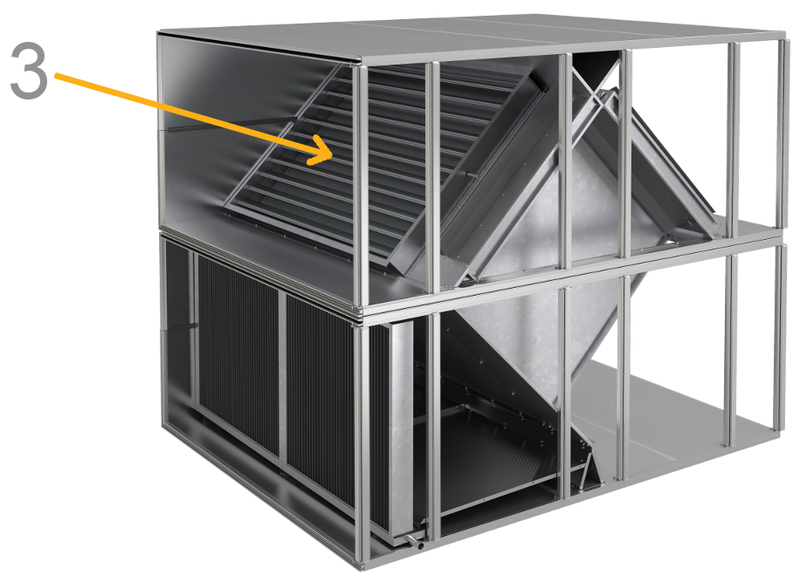 The formula is limited to the so-called dry recovery with a constant 20°K temperature difference between the indoor air temperature and outdoor air temperature and balanced mass flow in the supply air and exhaust air lines, and it also imposes the minimum values of energy recovery efficiency. Thus, starting from the first of January, 2016, the minimum efficiency is 63% for run-around heat recovery systems and 67% for other systems (the mixing box is not regarded as an energy recovery system). The dry recovery efficiency for VENTUS VS 10 – VS 180 air handling units are calculated in compliance with the COMMISSION REGULATION (EU) No. 1253/2014. The dry recovery efficiency for VENTUS VS 230 – VS 650 air handling units are calculated in compliance with the COMMISSION REGULATION (EU) No. 1253/2014. 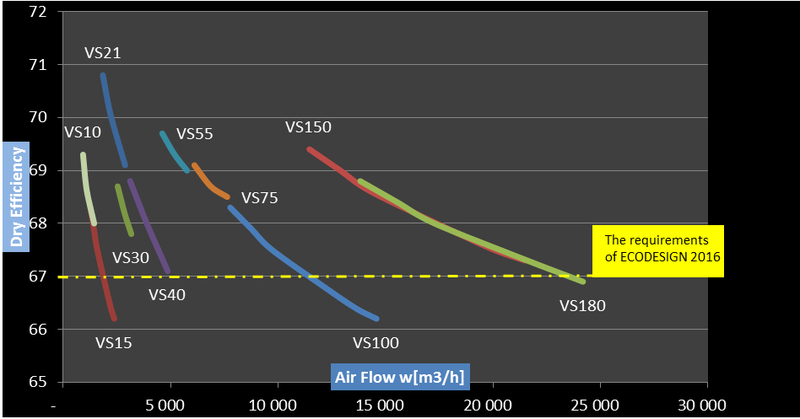 IT should be also noted that air flow resistance is increased two times on average at air flow speed in the centre window of between 1.6 and 1.8 m/s and the centre mass increases as a result of the mass of the exchanger itself and the increase of centre enclosure surface. 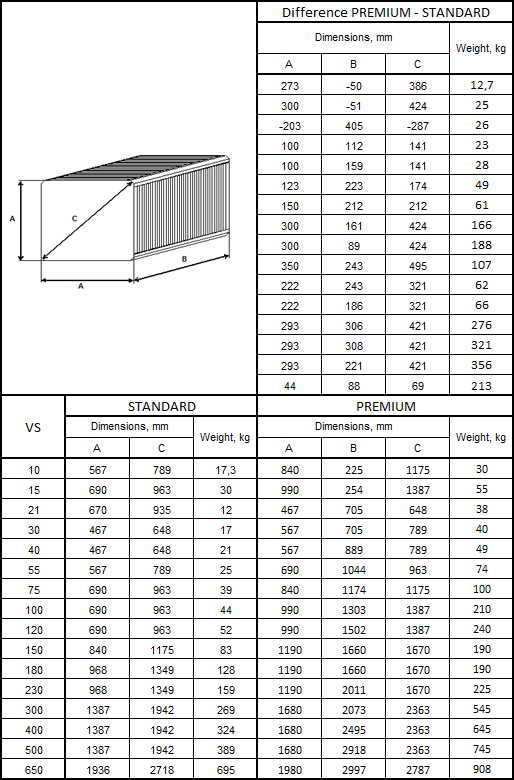 The comparison of masses and dimensions of cross-flow exchangers has been presented below. such by-pass in VS 10-VS 15 units. Greater heat recovery efficiency requires larger equipment. Consequently, the air handling units with PREMIUM recovery will be longer than the units with standard recovery by 366-730 mm, depending on the size of the equipment and flow configuration. With the introduction of recuperators with PREMIUM recovery, VTS proposes integrated mixing chambers in the unused by-pass space of the recuperator. The integration of the mixing chamber with the cross-flow exchanger significantly changes the appearance of the handling unit and its configuration. The elements equivalent to cross-flow exchanger blocks with the mixing chamber have been presented below. In order to ensure correct operation of the exchanger for cooling recovery, that exchanger is factory-equipped with dampers closing the flow at the cross-flow exchanger. 3 – air damper closing the flow of air at the cross-flow exchanger. 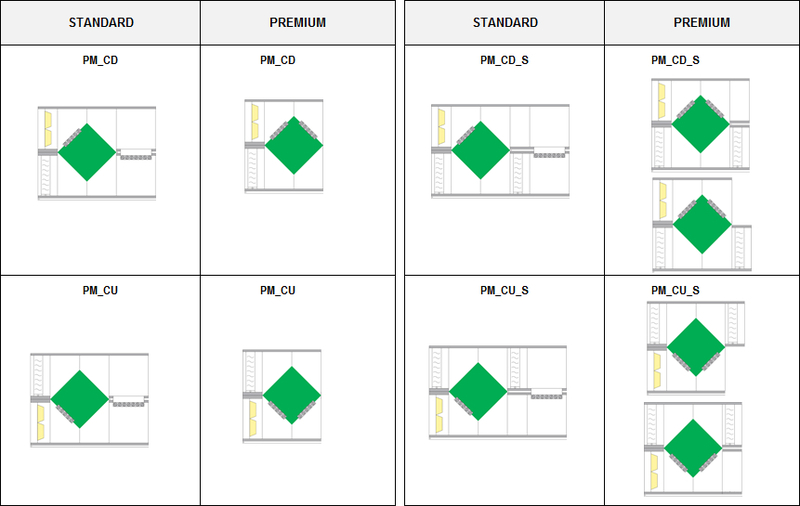 Since the mixing chamber is moved to the by-pass space, PM arrangements with the PREMIUM option are usually shorter than the systems with the standard option. The difference is within the 366–720 mm range depending on the model. Thanks to PREMIUM options, VTS offer does not only comply with EU requirements, but it is also a major step in increasing competitiveness of VENTUS products.